I guess I'll have to wait for Apple then! What's annoying is that the shaders work well when I use minecraft on Windows in Bootcamp on my computer, but I really would rather not have to switch to windows every time I want to play! There's this huge texture problem happening when I activate Optifine, the shaders work perfectly without it. 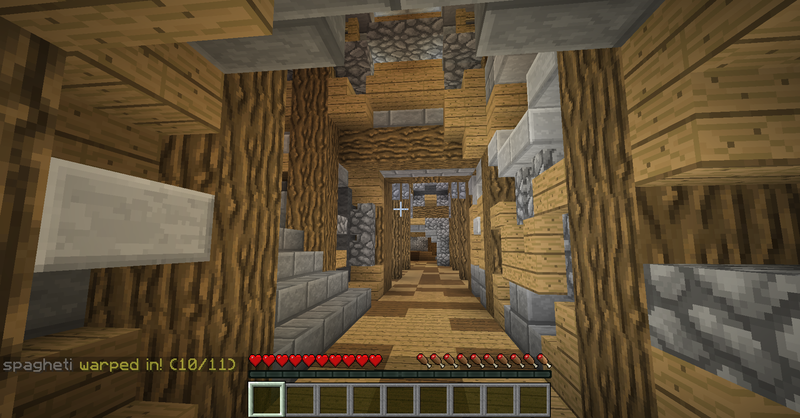 I'm running on Forge 9.11.0.897 and Optifine C4 w/ fix. I've had a look at OpenGL extension viewer and my OpenGL version is 4.1 so my drivers are ok, but, if I look in MC / options / snooper settings the OpenGL version is still 2.1, so I think that even if Apple do update the drivers for your GFX card then there will still be some issue with MC not using 4.1. I wonder what your snooper settings would say under windows bootcamp? ... I might just give bootcamp another whirl now 8.1 is out. Even with 4.1 the newer SEUS v10 shaders don't work for me on Mavericks, I don't have his development shaders to try so I can't say about them. Looks like Windows is the place to be on a mac if you want the new Sues shaders to work or other shaders to work faster. No problem, glad to help where I can :)! Changes are the MC Snooper settings is reporting the driver version available from the video drivers on the system. I mean, it's stating which version it is running, but that is the only version available due to the drivers. The OS supports OpenGL 4.1, the video may or may not, and the drivers don't seem to at all. I just pieced together my 'hackintosh' so, hopefully I can play a bit this weekend. It's running an AMD 5850 though. I might be able to test on my son's computer, with the GTS 450 as well, just need a different boot loader for him. I get this when selecting a shader. Yes, that is a known issue when changing shaderpacks/resourcepacks.. It is partially fixed, works for some, so it must be mod-dependent. If you select your shaderpack, logout of MC, and fire it back up -- it's all OK.
Because smartmove, the model doesn't get resetted correctly. Ah yeah any news about that Karyonix? I hate it to my move the glsl jar out of my mod folder all the time, to play on our modded server. Can someone please tell me how to stop the water from waving and also how to make the tree's stop waving so fast. I want the tree's to wave but very very slow, and the water not to wave at all. I'm liking this mod very much. Apreciate the time you took to update it, thanks. I LOVE HOW 1.7 CAME OUT TODAY AND PEOPLE ARE ASKING FOR UPDATES FROM LIKE EVERY SINGLE MOD. "You don't know what you're up against,"
But if we ask more, it releases faster, right? This is why I usually don't come to the fourms. Nothing can be done today for 1.7. I will wait for MCP to update first. It will take severral weeks or months for 1.7 mod update. When I install Forge, my minecraft just closes and never opens. Why does this happen? I have tried to install multiple versions of it but they don't work. Please help! How do you install forge ? Minecraft version ? Forge version ? Which file ? Which launcher ? OS ? Can anyone help me with this glitch? my hand keeps disappearing! What are your shader options at?